Veteran residents of Pleasant Street Apartments – a 32-unit apartment community in Beverly, managed by Braintree-based real estate firm Peabody Properties, Inc. and offering permanent, supportive housing for homeless veterans – recently participated in a September 11th Remembrance Ceremony held at Endicott College, in partnership with the United Way and the City of Beverly Veterans’ Services. The special ceremony included remarks from Endicott College President, Dr. Richard E. Wylie, and a reading from Pleasant Street Apartments resident and veteran, Bobby Lingo. Following the ceremony, local members of the military, fire officials, police officers and Endicott College students teamed up for a commemorative softball game. 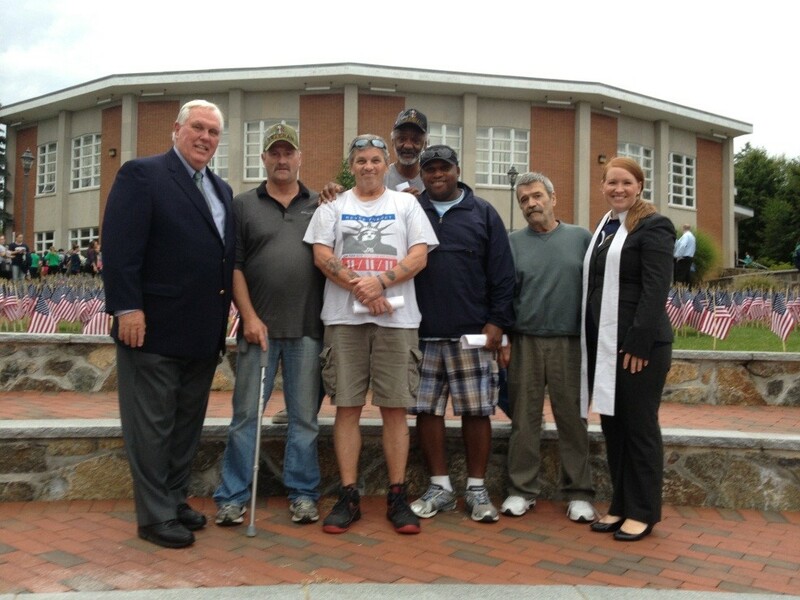 Pictured from left to right, are Endicott College President, Dr. Richard E. Wylie; Pleasant Street Apartments residents and veterans Ron Howard, James Simpson, Jeff Clark, Bobby Lingo and Joe Grace; and, Assistant Director of the Counseling Center at Endicott College, Lindsey Shrayer.